I have recently been working with the TLC5940 LED Driver chip. This provides 16 PWM outputs which can be used to drive common anode LEDs and I suspect motors etc. For the moment I will be using it to drive 16 LEDs to prove the principle and work out how to interface the chip to the Netduino Mini. 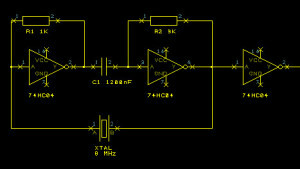 Timer circuit to control the grey scale output. A description of PWM and how it works is assumed. If you require more information then you can check out the Wikipedia article on PWM. The final inverter is not really necessary but the chip contains 6 inverters and I was only using two so I fed the output from the timer through an final inverter. This had the effect or producing a squarer signal – although the final signal is still slightly rounded. In the final circuit I actually used a resonator. I simply dropped this in place of the crystal connecting the outer two pins to the logic gates and the centre pin to ground. As well as the clock signal, the TLC5940 requires several control signals to determine how the chip should treat the grey scale data. This section looks at each signal and describes its function. This pin determines the output state of the TLC5940. When this pin is high the outputs are turned off. Setting the pin low turns the outputs back on. More importantly, it changes the internal counter for the PWM control and resets the counter to 0. It is to this counter to which we now turn out attention. The TLC5940 uses 12 bits to determine the output level for the LEDs connected. Each LED is controlled independently and the full array of 12 bits requires a total of 192 bits (12 bits x 16 LEDs) of data to determine the output levels for the LEDs. The 12 bits for each LED gives a total of 4096 (remember this number, we’ll be using it later) levels for each LED (0 to 4095 inclusive). The TLC5940 uses this data and the current counter to determine the output state of each OUT pin. For each output compare the counter with the greyscale value for the output pin. If the value is greater than the counter then turn the output on, else turn the output off. This process repeats until the internal counter reaches 4095 at which point the process stops and the outputs are effectively turned off (the counter value is greater than or equal the output value for the LEDs). This point is important as providing only one pulse to BLANK and a series of 4096 (or more) clock pulses makes this a one time only output. The LED on each output lights for the specified duty cycle and then turns off. The clock signal is split and one connection to the GSCLK (grey scale clock) pin on the TLC5940, the other connection is to the clock inputs of a 14-bit counter/divider (74HC4060). The divider counts the clock pulses and sets the output pins of the chip to represent the current value of the counter. The counter is reset once it reaches the maximum value and the whole process restarts. The counter does not output the lower three bits but this is not an issue for us as we are interested in counting to 4096. We can use the output from bit 12 (2 ^ 12 = 4096) as a BLANK signal for the TLC5940. So for the first 4095 pulses the TLC is setting the outputs according to the values held for each pin. When the counter reaches 4096, the TLC stops displaying data but then a BLANK pulse is received from the divider. This then restarts the whole process. The result, we have the outputs continuously cycling the the LEDs on for the required duty cycle. One final point about the BLANK signal. 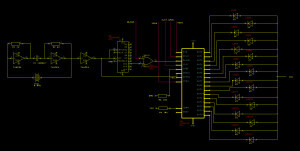 This could be used by the microcontroller which is controlling the circuit to turn off the outputs. To allow for this, the output from the divider is ORed with the BLANK signal coming from the microcontroller. The output from the OR gate is passed on to the TLC5940. This signal determines the type of data being transmitted to the TLC5940. When VPRG is high the chip expected 96 bits of data for the Dot Correction (DC) registers. The DC registers allow the controller to scale the output current supplied at each output pin. This is covered later in this article. When VPRG is low, the TLC5940 expects 192 bits of data for the grey scale registers. A low-high pulse on this pin latches the data received from the microcontroller into the DC or the GS registers. The data is latched on the rising edge (i.e. low to high) of the XLAT signal. Where Imax is the maximum current to be supplied. The value of 1.24 is the reference voltage on the IREF pin. For the LEDs I am using I want a maximum current of about 26mA. This gives a resistor value of 1502 ohms, so a 1k5 resistor should do here. This pin is an output from the TLC5940 and can be used to report when an error is detected. This pin is not used in this project and is connected through a 10K pull-up resistor to Vcc. Where Imax is set using the resistor connected to the IREF pin (discussed above). The whole circuit is controlled using a Netduino Mini. The four pink control lines in the above circuit are used by the Netduino Mini to control the TLC5940. XLAT Data latch signal. This could be connected to the chip select although in the initial implementation this is broken out to it’s own pin. VPRG Determine the programming mode for the TLC5940. High: Dot Correction data is being loaded. Low: Grey Scale data is being loaded. BLANK Turn the outputs (LEDs) on or off. High: Outputs off. Low: Outputs on. The constructor sets up the system to use the SPI interface and takes parameters to determine which additional control pins should be used. The display method takes two parameters, one for each of the dot correction data and one for the grey scale data. The main program contains a small demonstration of the functionality of this class and the TLC5940 chip. It slowly fades in 16 LEDs from off to full brightness and then fades them out to the off state again. This is repeated in a loop forever. For an example of the output see the video at the top of this article. The code is pretty well commented and so further discussion is not provided here. You can find the source code here (TLC5940.zip). Resetting the counter when it reaches 4096. At the moment this runs on until it reaches the maximum value. Use the dot correction values to allow different LEDs to be used on each pin. Different LEDs have different forward currents and this can be fine tuned using the dot correction data to allow the maximum brightness to be achieved by each individual LED. 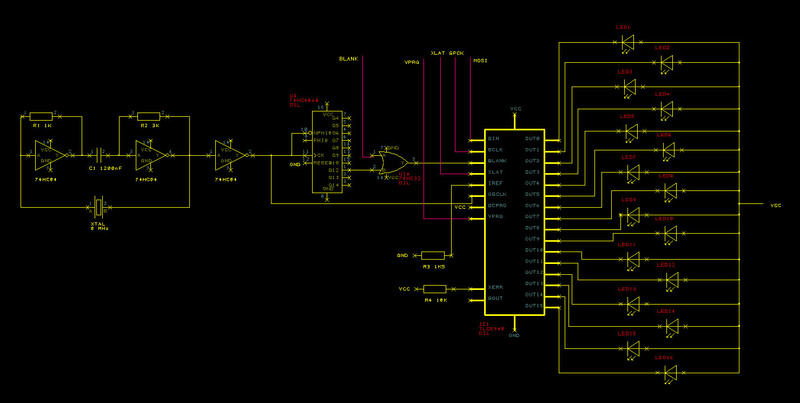 Look at using the CS pin on the SPI interface for the BLANK signal from the Netduino Mini to the TLC5940. Add some error checking code to check if the TLC5940 has detected any errors. Link two or more TLC5940’s together. 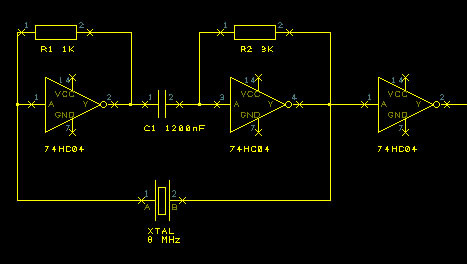 Adding these features will make this class more rounded and fully encapsulate the feature set offered by this circuit.